Two forensic experts explain blood stains. Khairulanwar & Jonathan Koh report. The coroner’s inquiry into the death of NTU student, David Widjaja, resumed on Tuesday with Dr. Christopher Syn, a senior forensic scientist with the Health Sciences Authority, and Ms Lim Chin Chin, HSA’s forensic science consultant taking the stand. Miss Lim testified based on the scene reconstruction report from 120 photographs, statements from SI Soh Chee Eng and her “observations and measurements” during her two field visits to NTU. According to Miss Lim, there was an “occurrence of altercation and blood-shedding event”, with items in the office being disturbed. A partial bloodied palm imprint was found on a doormat on the floor and was “likely to have been made by David’s bloodied palm on the doormat”. There was also a “blood pool which contained Assoc Prof Chan’s DNA profile” beside the computer table, indicating that Assoc Prof Chan was lying on the floor, with blood dripping “quite significantly” from his back. Dr Syn affirmed that blood on the broken blade turned up “DNA profiles of two different individuals” – both Assoc Prof Chan and David. There were two blood trails leading to opposite directions along the corridor outside Chan’s office. One belonged to Assoc Prof Chan, and the other which was more intense, David Widjaja’s. That such ‘bloodstains were quite closely spaced together” showed that Widjaja “was bleeding very heavily”. 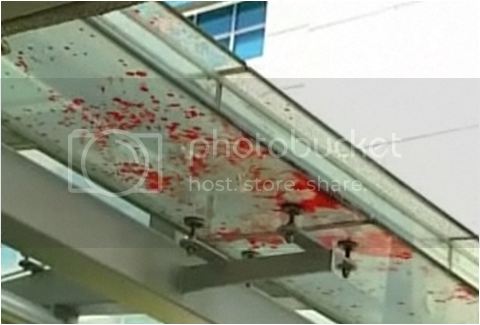 This blood trail continues down 2 flights of stairs, and continued onto the parapet wall that overlooks the roof of the NTU link bridge. There were two groups of bloodstains around 91 cm apart on the parapet. 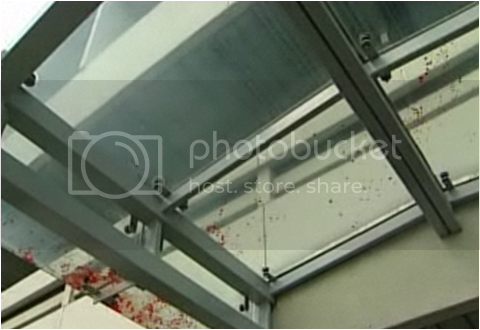 Further out, blood stains were also found on the glass roof and on the glass latch that protrudes from underneath. David was found lying on a grassy ground underneath the link bridge in a prone position. His feet were facing the link bridge. The ground was around four stories under the glass latch. Ms Lim gave a summarised re-enactment of the possibilities into Widjaja’s final moments. Widjaja had stood near the edge of the glass roof, dripping blood onto the glass latch. Stepping on blood puddles, Widjaja’s soles were stained. He sat down, and the back of his shorts came in direct contact with the surface of the glass latch, and was thus soaked in blood. His injured right wrist was placed near his right thigh, staining his shorts. Blood was also dripping down from his wound to the concrete ground below. Widjaja finally fell. This motion created the wiping action which cleaned off a part of the bloodstains on the glass latch, creating a white, “relatively clean” space between the other stains. The inquiry will be extended and is scheduled to continue on the 17 to 19 June and the 24th and 25th of June.